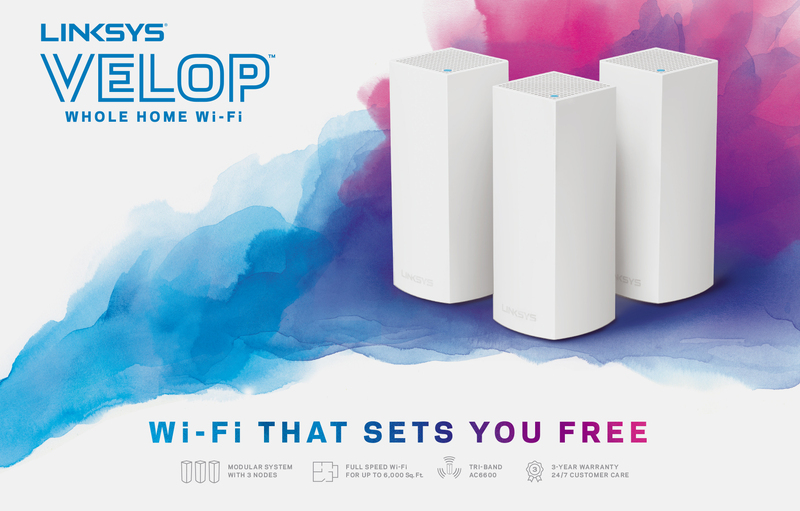 New arrival: Linksys Velop whole home Wi-Fi mesh system « Tech bytes for tea? Singtel has been offering their subscribers a home Wi-Fi mesh solution from AirTies since June last year. Velop will be available on www.Hachi.tech (from 12 April), Challenger stores (13 April), Singtel outlets (22 April) as well as Atlas showrooms, Newstead, Popular outlets and authorised resellers (12 May) in Singapore. Below are more details about Velop from their press release. Velop is a complete wireless and wired solution that is simple to use, exceedingly fast and provides 100% speed to the edge of a home network. High performance hardware, new software features and a 3-year warranty make for the best overall value. Singapore, April 6, 2017 – Linksys®, the home router pioneer and first to sell 100 million routers globally, today announced the introduction of Velop™, its first Whole Home Wi-Fi product. Velop is the first Tri-Band modular Wi-Fi system that can be installed in various mesh configurations, enabling users to get the most out of their broadband subscription by delivering 100% of their Internet speed to the edge of their network. “Linksys has always been pioneers in home networking. We are constantly coming up with new solutions that not only complement the next generation devices, but also enhances our users’ home networking experiences. Velop was developed with this mission in mind. It combines performance, design and ease-of-use, thereby delivering a seamless and reliable Wi-Fi that stretches to every corner of your home”, said Jenny Ng, Managing Director for APAC, Linksys. Velop is designed for performance as well as elegance; it is small enough to be placed anywhere, with a clean and attractive look that appeals to everyone. Each Velop “node” is a powerful Tri-Band AC2200 device that serves as router, range extender, access point, and bridge, providing users with the future proof technology they need as more devices enter the home environment. Each node is configured during setup by the accompanying Linksys app (available for iOS and Android), which provides the industry’s simplest and most intuitive interface. The app leverages Bluetooth to securely communicate between the mobile device and each node. After setup is complete, the Linksys app serves as a powerful Wi-Fi management tool with useful features such as guest access, parental controls and device prioritization. Linksys is the first to combine the technical benefits of three Wi-Fi radios with true mesh capabilities to provide 100% of broadband Internet speeds to the edge of the network. With traditional router and range extender combinations or dual-band modular mesh systems, the Wi-Fi speed is cut in half with each “hop” from one access point to the next. “As the world goes wireless, we are excited to be collaborating with Linksys to help our customers connect to, and connect with a repertoire of wireless solutions for their homes. The always-on, full-strength and ultra-fast Wi-Fi mesh system that is Velop will deliver an outstanding audio and video experience for our customers. At Atlas, we believe in the power of connections and this partnership will enable people to connect, share and sync across generations, and enjoy great music wirelessly in their homes with Bose,” said Sherwin Siregar, CEO of Atlas Sound & Vision. This results in users receiving only a fraction of their broadband Internet speed at the edge of the network. Velop uses the three radios dynamically to determine the optimal path from the modem and “parent” node to each “child” node to ensure the fastest speeds to all client devices, regardless of which node they are connected to. Dynamic channel scanning algorithms evaluate the unique conditions of the wireless environment to select the best band (either 2.4 GHz or one of the two 5 GHz radios on-board) as well as the channels within each of the bands to improve performance between nodes and client devices. Other Tri-Band modular systems cannot operate in multiple mesh configurations without introducing the bottlenecking effect due to their static “back haul,” where a single radio is defined for inter-node communication, limiting their mesh capabilities. Velop can operate in a number of different mesh topologies and leverage all three radios for inter-node and client communication. Velop can also use an Ethernet connection for inter-node communication to allow all three radios to communicate with clients and help Wi-Fi reach distant locations, such as the basement or the garage. The union of dynamic Tri-Band technology and true mesh configuration makes Velop the only modular Whole Home Wi-Fi system to provide 100% speed at the edge of the network. The award winning Linksys product experience team collaborated with the hardware development team to create an aesthetically-pleasing product which compliments your home decor. Velop is a 2017 CES Innovation Award Honoree, and one of the eleven finalists for 2017’s CES Last Gadget Standing awards. Each node is a small tower standing just seven inches in height. The footprint of each node is 88% smaller than the average router, and the soft white color palette allows the device to blend into whichever area of the house it is placed in. The vertical orientation also has performance benefits: the six antennas are placed at the top and middle of the unit, some pushing signal up and down and others pushing signal left and right. This improves Velop’s Wi-Fi performance in both single story and multi-story homes. To eliminate cable clutter, the base of the design features a cavity where power and Ethernet ports are hidden, with a small notch and rubber tabs to organize cables in a tidy manner. The result is an elegant and home-friendly device that fits in any environment or décor. The Linksys app (formerly known as the Linksys Smart Wi-Fi app) is completely redesigned and includes an innovative app-led setup process for Velop. The entire setup flow happens within the app and uses Bluetooth to securely communicate between the mobile device and the nodes. When the user customizes the network name to their liking, the app maintains a connection to Velop and does not force the user to exit the app, reconnect and/or change Wi-Fi settings on the mobile device. This resolves a critical issue in the installation of any new home Wi-Fi network. The app presents animated visuals and thoughtful troubleshooting instructions to guide even the most novice Wi-Fi user through the uninstallation of current networking hardware, and installation of the Velop parent node. After a successful setup, users will be automatically directed to the main dashboard of the Linksys app where they can confirm connection to the Internet and see how many devices are currently connected to Velop. The dashboard also provides quick access to your Wi-Fi settings, guest access, parental controls, and device prioritization. The Linksys app, available on iOS and Android, works for all Linksys app-enabled products including the Max-Stream™ family of routers. This entry was posted on Thursday, April 6th, 2017 at 7:00 pm and is filed under Accessories, Belkin, Entertainment, Events, events, Gadgets, gadgets, Internet, Internet of Things, Launch, Lifestyle, Linksys, Network, newArrivals, Press Release, Prices, Range Extenders, Router, Specifications, Wi-Fi. You can follow any responses to this entry through the RSS 2.0 feed. You can leave a response, or trackback from your own site.